The outer space has always been a marvel subject to discuss. Human beings have studied the sun, the moon, and the stars, even from many centuries ago. As a parent, I know that my sons enjoy stargazing at night. If you're wondering how to expose your kids to more information about this subject, you might want to check out my app pick for today. It's a unique alphabet flash card app called ABC for Little Space Explorer. As the name suggests, it includes 26 vocabularies that may intrigue young juniors who want to learn more about our universe. When you start the app, you will see a grid of letters, from A to P. Once you select a letter, the app will redirect you to the page associated with that letter. For example, the first screen is A for Astronaut. You can then move forward/backward from the navigational buttons on the top corners of the screen. If you want to jump to a particular letter, tap on the Back button that's located on the top center of the screen. Each page is dedicated to a single letter. Some of them try to explain the definitions of celestial objects and terms related to them. For example, you can use the P for Planet and O for Orbit pages to explain these concepts to your juniors. The app also includes pages on S for Solar System and U for Universe. Within each page, there's an information box that you can access by tapping on the blue info icon. This is very useful if you want more background information about the object/phenomenon being shown on the page. For example, you can use this feature to get more info on specific planet pages, such as E for Earth, J for Jupiter, and N for Neptune. The app also dedicates pages for space-related phenomenons, such as C for Crater, L for Lunar Eclipse, and M for Meteor Shower. You can also learn about space-related terms, such as F for Flying Saucer, R for Rocket, and T for Telescope. There are a couple of pages that are not directly related, such as K for Kinetic Energy and V for Velocity, but are fun to play with. Many pages in this app have great interactivity designed into them. For example, you can throw objects in to the Black Hole to see them slowly swirling into darkness. In the G for Gravity page, you can see how an airplane travels from one end of the earth to another, demonstrating how the earth's gravity works. And, one of the most fascinating pages is the Y for Year page, where you can see the progression of time as the earth moves around the sun. You can even speed up the time machine to see how it will affect the earth's movement. It impresses me to see the amount of new knowledge being offered within this app. For example, I wouldn't have known about Double Star System and Quasar if it weren't for this app. Some of the information boxes include external links to Wikipedia articles. But to prevent your juniors from directly accessing the internet, the app will prompt you with a math equation that only older juniors can solve. Based on my experience, ABC for Little Space Explorer is definitely not the first alphabet flash cards app that you want to introduce to your juniors. It's more suitable for juniors ages 3+ who want to learn more about outer space, celestial objects, and the various phenomenons associated with them. On the other hand, I wish the developers would include basic terms, such as Moon and Sun over Meteor Shower and Solar System. I believe that would make the app more junior friendly. The app includes several pages where you can interact with the sun, the moon, and the planets in our solar system. I really like how the developers implement this feature. Simply tap on any object to put it on the center of the screen, pinch to zoom any part of the solar system, and tap and hold your finger to pan the camera and see other parts of the solar system. Another page that I like is W for Weight. It nicely shows how our body mass would weigh differently in other planets that have different gravity measurement from the earth. 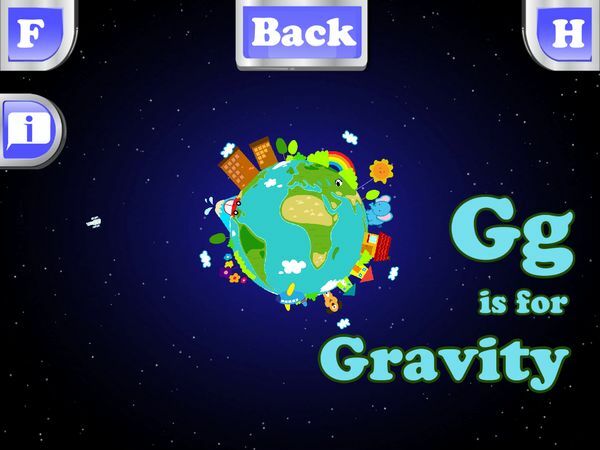 Simply enter in your body weight and navigate from one planet to the next to see how your weight is re-calculated to match that planet's gravity. Two other pages that I really appreciate are X for X-Ray and Z for Zodiac. In the X-Ray page, you can see the differences between scanning an object using an X-Ray, a microwave, an infrared, an ultraviolet, and a radio wave. In the Zodiac page, you can see how the different stars alignments that make up the 12 Greek zodiac, from Capricorn to Sagittarius. ABC for Little Space Explorer is an alphabet flash cards app with a unique space exploration theme. It's perfect for juniors ages 3+ who want to know more about the outer space, celestial objects, and the various phenomenons associated with them. As a parent, you may even learn a new thing or two.